- Kick the tires and light the fires to 350 degrees. - I divided the chocolate chips into 2 portions, 2/3 of a cup and 1/3 of a cup. For the white chocolate ganache, you need one bag of white chocolate chips and 1 cup of heavy cream. White chocolate did not seem to create the same heavy ganache that my dark chocolate ganache did, but I had mitigating circumstances on this baking project as well, interfering with my creating! I am going to try this with 3/4 cup of cream soon and see what the results are, but for now, this made an amazing tasting whipped ganache topping, so I will leave as is. You should start the ganache first since it needs to cool, so combine the cream and chocolate in a pot and start on the stove on low heat. When the chips are melted, crank the heat slightly to medium, and continuously stir and heat it up for about 20 minutes. White chocolate is notorious for burning easily, so keep stirring! d) I had to throw it mercilessly into the fridge and speed into work and it sat there until 7 am, no stirring, nuttin. Now for the brownies. Melt the butter in a pot, remove from the heat and stir in the white sugar. Once that is combined, mix in your cocoa. Add in your eggs. If you are using chocolate chips instead of chocolate chunks, you can mix in the 2/3 of a cup after the eggs are thoroughly combined into the mix. Once all that is mixed very, very well, add in your flour and barely stir it in. Just barely. I read somewhere that stirring the flour mixture creates gluten, which in turn creates the cakey texture I don’t like for brownies. So in theory, the less your stir, the less gluten and then chewy brownies here we come! Line a 9×13 pan with parchment paper, or grease it, but parchment works the best. 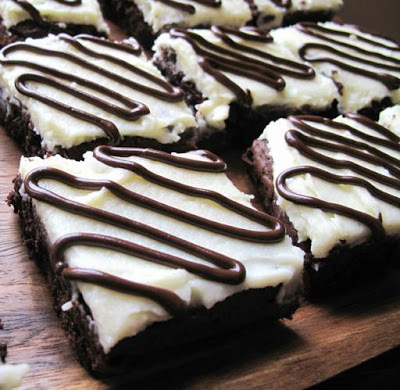 I am going to attempt this recipe in a 9×9 one day to see if you can make thick chewy brownies. For now, let’s leave it as is because if it ain’t broke, don’t fix it! I used chocolate chunks, which I placed on top of the batter. They are so heavy that they sink right into it. Bake at 350 for 15- 20 minutes, until the brownies pull away from the edges slightly. This is why I use the chunks, they sink in right to the top level of the brownies. Cool the brownies and then we will frost them! Now, I took my ganache and whipped it, since it wasn’t as hard as I wanted it to be. This turned out fantastic and went on the brownies soooo easily! If you want hardened ganache, just spread it on once it’s cooled, but not completely hardened. To make the pretty chocolate doodles on top, I cut the brownies and placed them on the tray I was taking them on. My poor ladies at work finally got good brownies instead of the cakey ones I took in. Don’t feel too sorry for them, they love being my guinea pigs. I put in the 1/3 cup of chocolate chips that I had quickly melted in the microwave, about 15 seconds at a time, stirring then re-starting the microwave again. Then I placed in a plastic icing bag and tip. Then I just put pretty wavy lines on the top, which then hardened, so you have a crunchy little topping on top of a whipped ganache and a chewy brownie. These were absolutely heavenly!